The kids are almost done with school, the pool is open, the grill is fired up and summer is here! What better time to buff up on your back yard safety then now? Backyards can be such a joy for family and friends to gather in, but the more your back yard entails, the more potential danger that can bring to your children or your neighbor’s children. As a responsible home owner, you need to take the time to inspect your backyard for safety hazards. These things can be as simple as your family grill, pool, lawn equipment or toys. Here are some backyard safety facts you may find interesting. – According to the U.S. Consumer Product Safety Commission, 350 children under five years of age drown each year in swimming pools. – Another 2,600 children under the age of five are treated in hospital rooms annually following submersion incidents, with some resulting in permanent brain damage. – Nationally, drowning is a leading cause of death to children under five. – Deck collapse is one of the most serious threats faced in recreational safety with more than 800 reported injuries and 20 deaths as a result of death collapse during the past 10 years. – Deck failure typically happens as a result of poor construction and poor maintenance. – Barbeque grills and portable generators can be a significant source of danger as they produce deadly carbon monoxide. Now here are some helpful tips to assist you in child-proofing your backyard according to the ICC Foundation and Building Safety Month 2010. – Make sure all gates in the isolation fence for your pool are self-closing and self-latching. – Remove all chairs, tables, large toys or other objects that would allow a child to climb up to reach the gate latch or enable the child to climb over the pool isolation fence. – Reaching and throwing aids like poles should be kept on both sides of the pool. These items should remain stationary and not be misplaced through play activities. – All pool and hot tub drains (suction outlets) must have a cover or gate that meets industry standards for suction fittings marked with “VGB2008” indicating compliance with the latest codes. 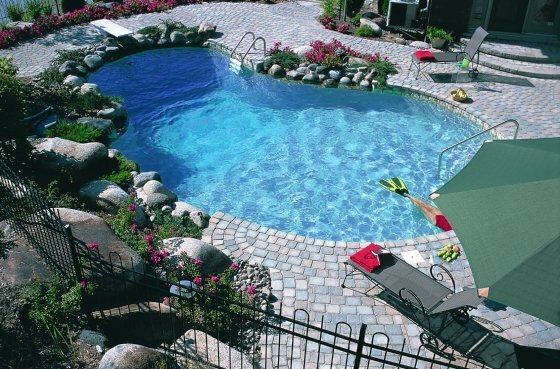 – Install a pool alarm to detect accidental or unauthorized entrance into the water. While the alarm provides an immediate warning, it does not substitute for the fences, door alarms and safety covers required by the code. – Install either an automatic or manually operated, approved safety cover to completely block access to water in the pool, spa or hot tub. Never allow anyone to stand or play on a pool cover. Never allow children near the pool without adult supervision. – Check for warning signs for an unsafe deck, including loose or wobbly railings or support beams, missing or loose screws that connect a deck to the house, corrosion, rot and cracks. – Place the barbeque grill away from siding, deck railings and out from under eaves and overhanging branches. It is also unsafe to use grills in a garage, porch or enclosed area that could trap carbon monoxide. Never grill on top of anything that can catch on fire. – When grilling, have a fire extinguisher, a garden hose or at least 4 gallons of water close by in case of a fire. – Keep children away from fires and grills. Establish a safety zone around the grill and instruct the children to remain outside of the zone. A chalk line works great for this purpose. Never leave the grill unattended. For more information on decks, fences or other services/products Mid Atlantic Deck and Fence has to offer, please visit our website at www.midatlanticdeckandfence.com!